Arthur McDonald is the co-winner of the 2015 Nobel Prize in Physics for his work on subatomic particles called neutrinos. This prize was shared by Takaaki Kajita of Japan, a professor at the University of Tokyo. The Nobel Prize in physics is the highest and the most prestigious award that is handed out every year by the Royal Swedish Academy of Sciences. Art was born in Nova Scotia and earned a master’s degree in physics at Dalhousie University in Halifax and a Ph.D. at Caltech in Pasadena. He began his career as a researcher at Ontario’s Chalk River nuclear research labs before taking up a professorship position at Princeton in 1982. In 1989, he returned to take up professorship at Queens University in Kingston, Ontario and to lead the Sudbury Neutrino Observatory (SNO) in northern Ontario. Art is now professor emeritus at Queen’s University. He was made an officer of the Order of Canada in 2006 and a Companion in 2015. Neutrinos are fundamental subatomic particles that are created in nuclear reactions taking place in the Sun and the stars, as well as the naturally occurring radioactive processes on the earth. Even though they are present in abundance in the cosmic rays reaching the earth, and rarely interact with matter, they are very hard to detect. Billions of neutrinos are harmlessly passing through our bodies every second, yet we cannot see or feel them. The existence of these almost massless, electrically neutral particles was postulated back in 1930, by Austrian physicist, Wolfgang Pauli, as he was trying to explain conservation of energy in some nuclear reactions. For over two decades these particles remained hypothetical, but in 1956, two American physicists, Frederick Reines and Clyde Cowan discovered neutrinos emanating from nuclear power plants in the form of tracks seen in their detectors, which proved their existence as particles. Another problem that had baffled physicists is that they could calculate the number of neutrinos created in the nuclear reactions taking place in the Sun, which make it shine. But when the appropriate measurements are made on the earth, only one-third of the neutrinos are accounted for. The missing two-thirds of the neutrinos had been a puzzle for years. To explain this scientists had suggested that the three known kinds of neutrinos could oscillate from one type to another as they travel. The detection of these particles in labs is difficult because of the many other cosmic particles reaching the earth and the numerous natural radioactive decays taking place. Physicists have thus tried to go underground to shield off the unwanted particles and detect the neutrinos passing through water tanks fitted with thousands of light detectors that could amplify and measure weak flashes. It so happens that, as expected, a large majority of the neutrinos may pass through the water tank, but a few of them may collide with an atomic nucleus or an electron in the tank. When this happens, electrons are produced that generate light known as Cherenkov light. The characteristics and intensity of light helps physicists understand what type of neutrino is produced. Takaaki Kajita started carrying out experiments in 1996 at the Super-Kamiokande detector located 1 kilometer deep inside a zinc mine in Japan, and proved the oscillation of neutrinos coming from the atmosphere. 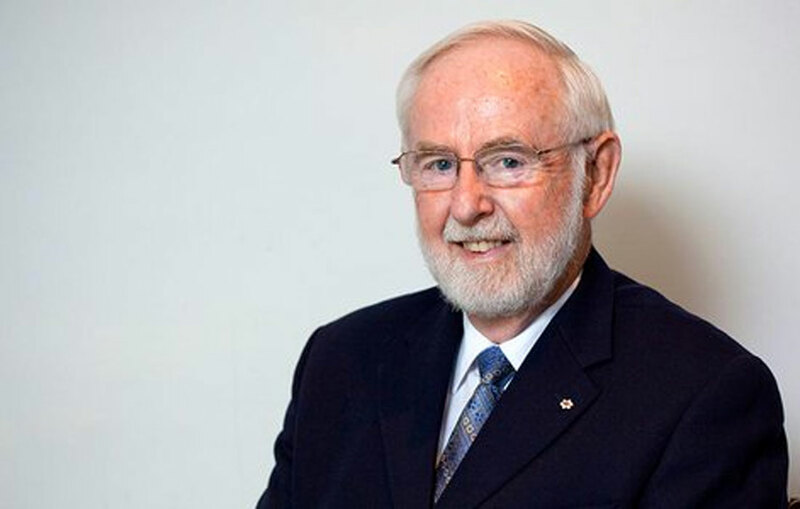 Art McDonald started supervising the construction of the SNO in 1990 that was designed to detect the neutrinos emanating from the Sun. SNO is a giant neutrino detector built over 2 kilometers underground in a nickel mine in Sudbury, Ontario. A huge transparent acrylic tank, containing 1000 tonnes of heavy water worth $300 million was surrounded by a geodesic sphere equipped with over 9000 light sensors, and this assembly in turn sunk in a massive cavity filled with regular water. All of the construction was carried out in ultra-clean conditions. By 2001, Art, along with his team, showed that the neutrinos produced in the sun were indeed oscillating into the other two kinds and therefore had mass. This not only accounted for the missing solar neutrinos, but has made physicists optimistic about understanding the structure of the Universe, and also the physics of fusion reactions going on in the Sun. These processes are important for replicating similar processes in fusion power reactors on earth. SNO has since been expanded into SNOLAB, where further sophisticated particle experiments are being conducted. It is also a cutting edge facility, where young Canadian minds are being stimulated to research the structure of the Universe and other areas of physics. Art, you have surely made Canada proud. Congratulations on this huge and well-deserved honour. The RECORDER requested Art correspond for a short question-andanswer session, which he kindly agreed to, and is included below. How did you get started with research on neutrinos? I have always been interested in measurements using nuclear and particle physics techniques that can provide insight into the basic laws of physics. Neutrinos are the basic building blocks that we know the least about because they are so difficult to detect. Therefore they were of substantial interest because if one could measure their basic properties it would be of great significance for the basic laws of physics. The SNO Collaboration was formed with 16 scientists in 1984 to pursue an idea put forward by Professor Herb Chen of the University of California that one could use heavy water to measure whether neutrinos from the sun change into other types before reaching the earth. We were inspired to tackle this project as it seemed that this might be the best way to answer this major question about neutrinos and it seemed that it was a unique scientific opportunity for Canada where the combination of large reserves of heavy water and an ideal underground location might be available. It is said creativity is intelligence having fun. Would you agree? In your mind how does creativity play a role in science? I do agree. I was the Director of a major project with hundreds of very intelligent scientists, engineers and technicians having fun. It was a real pleasure to see the creativity that resulted, creating solutions to very difficult technical problems. As a result we were able to build an ultra-clean detector the size of a ten story building, housing 1000 tonnes of heavy water safely 2 kilometers underground in an active nickel mine and observing one burst of light from a solar neutrino per hour with little or no interference from radioactivity of any kind. There were many creative firsts in this project. During your active research life, how did new ideas come to you? Sometimes after careful thought of the many possible ways to do something, following detailed research on the topic and sometimes out of the blue, even waking up in the middle of the night with a new idea. Very often in the large collaboration by consideration of a variety of ideas put forward by a set of creative people and then achieving consensus through detailed discussion. It is said in research, the scientists get addicted to science. There are many cases where scientists lean more towards the science they practice. Your comments? Scientists are experts in a particular area of science that they consciously chose, so it is natural for them to prefer that area. Scientists, like many other occupations, become very interested in their work, in some cases it can become an addiction, but I am not sure that it is more so with scientists than other occupations. Most scientists I know work hard, but also have well balanced personal lives. What is the state of fundamental research in Physics in Canada? What are the hurdles if any, and how can they be overcome? Canada has benefitted greatly from programs initiated by the federal government in the 1990’s such as the Canada Foundation for Innovation, the Canada Research Chairs, funding to universities for indirect costs of research and several others. As a result, the citations for academic basic pure and applied research per capita in Canada are among the tops in the G7. At present, there is an imbalance between the funds that have been awarded for equipment and infrastructure and the funds for operation of the equipment for research. This should be rectified by additional funding to the three granting councils. Another thing that requires attention from Canadian industry in partnership with government and academic institutions is the fact that per capita, the investment by Canadian industry in research and development is in the lower section of the G20. This is an important question to be addressed by industry in partnership with the very successful academic scientists in basic and applied research mentioned above. It has been observed as a trend that not many youngsters opt for physics and math when they get into the University, but like to pursue their studies that could fetch them lucrative careers. Do you think this is a cause of concern, and how can we improve it going forward? After all, Canada needs to generate more Nobel Laureates like you. We do not see a significant decline in numbers of people interested in physics and also have a healthy enrollment in engineering physics at Queen’s. Careers in these areas can be very interesting and are adequately paid. However, we need to inspire an entrepreneurial spirit in our youngsters if we are to increase the R&D done by companies in Canada, including new startups based on innovation. Development of such innovation can combine interests in science and math and interests in a lucrative career and can be of benefit to the country. Some universities such as Waterloo are focusing on entrepreneurial spirit in parts of their programs and that is something that should be more general in educational institutions. As I mentioned, Canada is doing well in basic science and making significant contributions as measured by citations. That is usually an excellent measure of scientific success.